Cape Town Floriography is a public history and art project that takes place at various flower markets in Cape Town on Heritage Day, 24 September 2016. A series of flower wrapping papers will be launched which highlight aspects of the history of flower selling in the city. Further, Cape Town Floriography postcards will be distributed at the flower market in Adderley Street and Trafalgar Place. Visit the flower sellers on Heritage Day, buy a bunch of flowers and collect a flower wrapping paper, postcard or both! 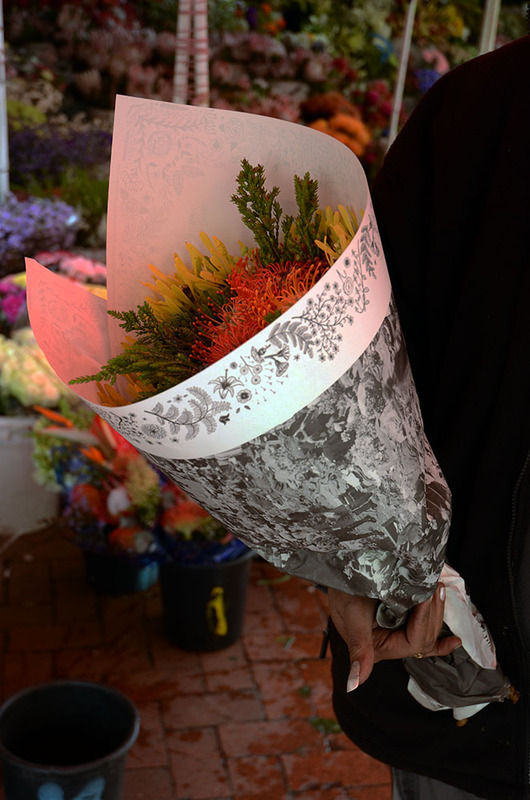 Cape Town Floriography wants to disrupt the dominant ways in which flower selling in the city is framed as an old tradition that has always been there. Instead, Cape Town Floriography highlights that flower selling is not merely a tradition but has a history that was actively made possible by the people and plants involved in the trade. Flower sellers have been working in Cape Town’s streets since the mid-1880s and many families have been in the business for several generations. They regularly had to counter developments that put the future of their occupation at risk, including racist legislation that excluded them from access to the commons, forced removals and unfavourable urban planning. Flower markets emerged not merely as pretty backgrounds of city life but as sites of urban politics. Cape Town Floriography wants to complicate perceptions of urban life in the city by shifting the focus on stories that are less heard and seen. Cape Town Floriography is concerned with stories of people, plants and the worlds they share. These stories might help us to envision alternative worlds to the one we currently live in and inspire us to find solutions to the various social and environmental crises we face. Cape Town Floriography experiments with creative ways for researching and documenting knowledge about city life, public space and human-nature relationships. The term floriogarphy literally means writing with flowers. Floriography refers to the idea that a language of flowers exists in which flowers are associated with meanings and messages can be exchanged in the form of flower arrangements. Cape Town Floriography wants to explore how developing ways of reading and writing with flowers could enable us to make sense of what is going on around us. The work of Cape Town Floriography is grounded in the flower markets and takes both the people and plants involved in the cut flower trade serious as guides in its endeavour of learning and documenting. The first installation of Cape Town Floriography consists of a series of three flower wrapping papers that engage the past and present of flower selling in Cape Town from various angles. The flower wrapping papers will be distributed to the markets across Cape Town and can be obtained together with a bunch of flowers. For long flower sellers have used newspaper sheets to wrap up flowers. Old newspaper was thereby given a second life. Cape Town Floriography is inspired by this recycling of newspaper, however it changes the direction of the cycle by producing a new paper that can only be read once the flowers are unpacked. The flower markets in Cape Town, especially the oldest and biggest one in Adderley Street and Trafalgar Place, are widely regarded as essential parts of the urban fabric and the flower sellers as icons of Cape Town. However, while large photographs of flower sellers greet travellers at the airport and every tourist handbooks mentions the flower market in Adderley Street among the city’s main attractions, information about what is going on at the flower markets is more difficult to find. The text about the history of flower selling featured on one of the flower wrapping papers elabortes on how the image of the flower sellers emerged as an icon of Cape Town from the late 19th century onwards. The iconic represenations of flower sellers as female, poor and “coloured” or Malay stands in a genealogy with images of flower girls that emerged in European cities in the 19th century. These images had often more to do with the fantasies of the mostly white photographers, painters and writers than with the lived realities of the people involved in the cut flower trade. The text on the paper further traces the relationship between the sterotype representations and the activities of the flower sellers who have not merel been victimised by the images but also activel used them as a resource to negotiate access to trading space and business opportunities. Many of the public archives and libraries in Cape Town hold postcards and photographs depicting flower sellers in their collections. The National Library of South Africa, the Iziko Museum of South Africa’s Social History Collections and the Western Cape Archives are all centrally located in town. However, people involved in the cut flower trade often don’t access these collections, be it for lack of time to visit the archives or awareness that the archives and their collections exist and are open to the public. Many of today’s flower sellers belong to families who have been active in the trade for several generations. Copies of the images in the archives can thus constitute valuable additions to family albums, especially when the producers of the images failed to shared copies with the people they depicted. One flower wrapping paper features a photograph that was taken by J. Luckhoff in Parliament Street in 1947. The photograph belongs to the Social History Collections of the Iziko Museums of South Africa. Sandra Solomons with the flower wrapping paper depicting a photograph by J. Luckhoff from the Social History Collections of the Iziko Museums of South Africa. Flower markets are highly connected across space and time. The past is present, and the present is past. This is reflected upon in a collage featured on one of the flower wrapping papers. The collage consists of an archival photograph of the flower market in Trafalgar Place from the collection of the National Library of South Africa, Cape Town Campus, and recent portraits of vendors from markets across Cape Town. All flower wrapping papers feature a floral border drawn by Salma Price-Nell. The border consists of flowers that are available at the flower markets. These include flowers of plants indigneous to South Africa as well as exotic ones that are common in the cut flower industry. The flowers are grown locally in Cape Town, in greenhouses in Gauteng and on large farms in Kenya, Tanzania and Zimbabwe. Some of them are available seasonally, others are available throughout the year. We can at this point only speculate about the flowers of the future. Plants common today might become extinct and new hybrids might emerge. Developments of capitalism will impact on which plants will be grown in the future. Climate change, the availability of human labour and natural resources such as soil and water, scientific possibilities for genetical modification and developments of cultural uses of flowers by humans will further impact on the floral archive of the future. The flowers in the border hold together the content of the flower wrapping papers , and the papers in turn hold the flowers wrapped in them. Or do the wrapped up flowers hold the papers and the stories featured on them? Even if cultivated under highly controlled circumstances, the plants involved in the cut flower industry are alive and they participate in history both as actors and witnesses. Floriography is an attempt to find ways of listening to these flowers’ stories. The flower market in Adderley Street and Trafalgar Place has since the early 20th century been a staple subject of postcards of the city. The flower market was depicted on composite postcards along Table Mountain and governmental buildings, as cityscape on its own and also portraits of flower sellers were frequently published. We don’t know who the flower sellers depicted on the images are, as the photographers and publishers did not document them. They were more interested in the flower sellers as a genre of urban characters than in the individual persons. The depicted flower sellers were often not informed about the use of their images and did not receive any financial compensations. Today, many of these postcards are offered for sale in internet auctions. Their journey continues as collectibles. The Cape Town Floriography postcard series consists of six collages made from old postcards bought in online auctions from collectors around the world and new portrait photographs of flower sellers working in Adderley Street and Trafalgar Place today. Many decades lie between the flower sellers of the old and new photographs. They stand in the same place and practice the same profession, yet a lot has changed. The collages reflect on the connections and disconnections through time. The new postcard series also offers a way for the old postcards and the flower sellers depicted on them to come home. The next destination of their journey might be a family photo album somewhere in Cape Town. They might also once more deliver greetings across countries and continents, this time carrying the names of the persons whose images they feature with them. Cape Town Floriography is a Nowseum project. It is organised by Melanie Boehi. Salma Price-Nell contributed artwork and designed the flower wrapping papers. More installations of Cape Town Floriography are planned to take place in 2017.